in the White Mountains, Inyo County, California. Today's post is about a tree known as "Methuselah". Methuselah is currently the oldest verified living non-clonal organism known in our planet. Although it is a plant, I decided it deserves a place in the strange animals blog, just for being so old, older than most major ancient civilizations are. 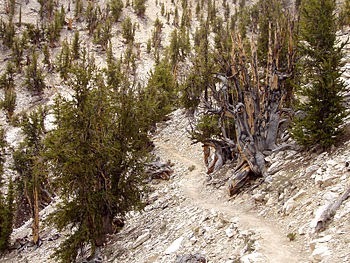 Methuselah belongs to the Pinus longaeva species, which is commonly known as the Great Basin Bristlecone Pine. The tree is located somewhere in the White Mountains of Inyo County in eastern California, growing at an altitude of 2,900 to 3,000 m (9,500–9,800 ft) in the "Methuselah Grove", inside the "Forest of Ancients". The tree's exact place is undisclosed by the U.S. Forest Service, in order to protect it from human-related activities, like vandalism. The ancient tree has been named after the Biblical Methuselah, who according to Christian scriptures lived for more than 900 years. Methuselah was sampled by Edmund Schulman and Tom Harlan, sometime during 1957 and was found to be 4,789 years of age, so today it is 4,842 years old! In other words, Methuselah is older than most human-made structures, including all Egyptian pyramids, having germinated sometime in 2832 BC. For comparison, consider that the Pyramid of Djoser (the most ancient pyramid) was built in 2630, about two hundred years later! In the past, there was another even older tree -of the same species- known as "Prometheus", that was at least 4,862 years old, possibly more than 5000 years of age. It was cut as a part of a research, however the ones responsible for cutting it were unaware of its world-record age. Video about Methuselah and Prometheus.